"Home is where the heart is" and Grantleigh boarding is a true "home from home" experience. The school offers boarding to both boys from Grade 4 – 12 and girls from Grade 6 – 12. The Grade 4-7 boys are housed in a 4-bedroom chalet, complete with a bathroom, study area and television. A full-time staff member resides in the chalet to ensure that the boys are always safe and are slowly intergraded into boarding at Grantleigh. 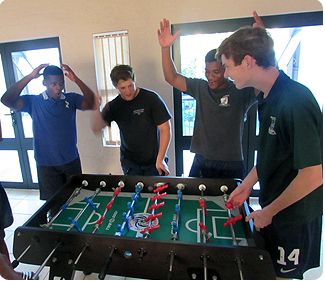 When the boys enter Grade 8, they are warmly welcomed into the new boarding establishment. This new facility is a modern double-story design and cleverly structured for boys and girls. It is set in a lush garden with a spacious quadrangle area where students can interact with one another. Boarders have easy access to a hockey astro turf, tennis courts, swimming pool and grass fields as we believe sporting activities are essential in the life of a healthy boarder. A family atmosphere prevails at both Founders and Grant House. The rooms are spacious and students are encouraged to make it their own and take pride in what is ultimately theirs. Students reside in either two or four sleeper rooms, and with one shower and toilet shared by just two students, few boarding establishment can match such comfort. The rooms are well equipped with built-in desks and chair to allow the students to study in their own private, quiet environment. Structured homework takes place every evening and is supervised by the resident staff who are available to see to the personal needs of all the students. A common prep room area is available to allow the younger students and those in need of extra assistance to work under closer guidance from the boarding staff. Students are welcome to enjoy some relaxation time by socialising in their separate common rooms, reading, playing board games and even watching their favourite movies on TV. Structure and routine are very important at Grantleigh and the boarding establishment is no exception, as the discipline of the students is closely monitored by the senior house parents. Staff are ably supported by the two Heads of House from the student body. The girls enjoy all their meals in the dining room together with the boys from Grant House; this gives the staff and boarders from both houses time to interact with one another, reaffirming a real sense of camaraderie and care amongst the Boarding Establishment ‘family’. The Grant House Parent, Mr Rhoan Abbott and his family live on the premises and is always available to offer the boys support and guidance when required. 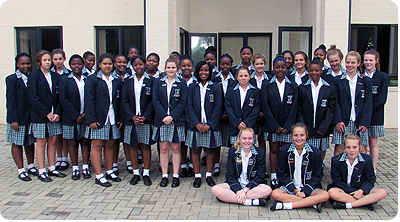 The Founders’ House Parent, Mrs Ronelle Raath and her family live in the original farmhouse on the premises; Mrs Raath’s care and compassion ensure that the girls feel constantly safe and secure. Both Deputy House Parents also reside on the estate.